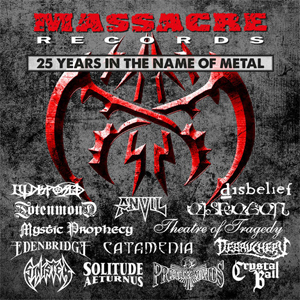 Massacre Records is celebrating their 25th anniversary with a new music sampler entitled 25 Years In The Name Of Metal, which will be released next Friday, March 18th. The 2CD sampler comes with an exclusive 3D cover and is full of all-time classics and brand new smashers. Check out the tracklisting below! Dont forget to follow and listen to Massacre’s 25 Years In Metal playlist on Spotify HERE.